This is the mincemeat I make every year. It really is special with its combination of flavours making it different from any other. Your mince pies will be the best you’ve ever made. It makes approx. 5 jars. You will need waxed discs and tight fitting lids or cellophane covers. Peel, core and chop the apple. Chop the walnuts and quarter the apricots. Mince the fruits – process in quick burst the apple, currants, raisins, sultanas, mixed peel, apricots and sugar. Put into a large bowl with the quartered glacé cherries, suet, mixed spice, nutmeg, grated zest of orange and the juice. Mix all well together, adding the brandy to give a moist mixture. Cover the bowl with a cloth and leave for 48 hours to allow the fruit to swell, stirring occasionally. Pack into sterilised jars. Cover with waxed discs and the screw top lids or the cellophane covers. Leave in a cool place to mature for approx 1 month. It will keep for at least 6 months. 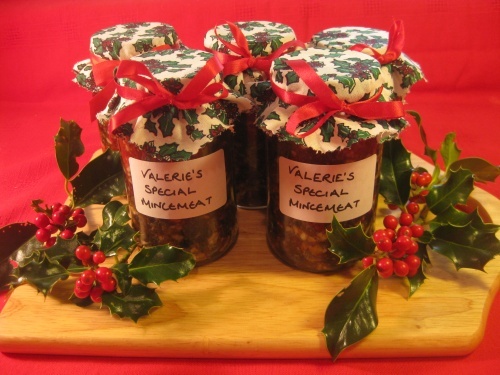 These jars of mincemeat make lovely presents, labeled and covered attractively.